Every year when the harvest season comes, lovers of photography of travelers flock to the highland area where there ar bewitching terraced rice fields. And the best destination is Mu Cang Chai district in Yen Bai province. In this entry I will give you some information about how to travel Mu Cang Chai. In addition to beautiful paddy terraces, you can also learn the unique features of H'mong ethnic people in the region. A life of poverty but warm with friendliness, something difficult to find in today's modern life. The highlights of the trip to Mu Cang Chai include the terraced rice fields stretching up to the clouds, taste the famous sticky rice and enjoy hot spring bath at Tu Le, feel the life of H'mong people. Harvest season in Mu Cang Chai is around mid September to the end of October. I recommend that you check information with hotels there before coming. 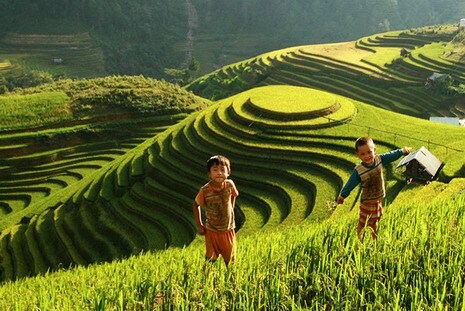 Another time to visit Mu Cang Chai is May or June when H'mong people start planting rice. It's also very beautiful watching the rice terraces reflecting the sunshine. It would be a bit too rush if you travel 2 days with motorbike or 3 days by car. The distance from Hanoi to Mu Cang Chai is about 280 km, it takes almost a day if you travel by public bus, you can spend the night in Tu Le commune or Mu Cang Chai town, spend your evening at leisure or walking around, and on day 2 you will spend the whole day wandering the featiful paddy fields, I recommend that you rent a motorbike, beautiful places to take photo is from Tu Le to Mu Cang Chai, stop at La Pan Tan commune where there are many rice terraces, the main point of Mu Cang Chai area. If you like walking you can catch the bus to La Pan Tan and then keep walking pass the high mountains for sightseeing, return to Hanoi on day 3 of the trip. You can contact and book before hand with the number belows: 0296263064 or 01665684574. A motorbiking adventure to Mu Cang Chai must be the first choice to behold the spectacular rice terraces, you can stop anywhere to take photos. Some highlights in your trip includes La Pan Tan rice terraces, Lim Mong valley, Khau Pha pass, especially you should go deep into La Pan Tan area, there is a dirt path along the valley, go deeper into the area you will find many wondeful corners to take beautiful photos. - Drive in the evening from Hanoi to Nghia Lo 190 km, you should start early as it may be dangerous to travel at night, especially if it is your first time traveling or those who have problems with eyes. Day 2 ride exploring the beautiful scenery at Khau Pha pass, the Lim Mong valley and La Pan Tan, sleeping in Mu Cang Chai. Day 3 back to Hanoi, visit some places on the way, lunch at Thu Cuc. If you have lunch at Nghia Lo you will arrive in Hanoi late. With option 3 days you will have more time to visit and take photos. Day 1 ride straight up to Mu Cang Chai, use your cameras in Khau Pha pass and Lim Mong valley, overnight in Mu Cang Chai. Day 2 focus on shooting and wandering in La Pan Tan, overnight in Nghia Lo, don't forget to try snake specialty. On day 3 you can travel to Suoi Giang, if you go to Ta Xi Lang you should start early. Afternoon drive to Hanoi. - Buu Dien guesthouse, contact Mr Thanh tel 0975644965 to book or you can ask him to contact people if you want a homestay. Several other motels along the main road. Should contact soon if youu go in harvest season, ensure your booking by making a down payment. Hotels in Nghia Lo - Yen Bai (A big town and should have more choices, if you go on holiday should book in advance). - Xom Vang guesthouse, located right at the beginning of Tu Le townlet, on the way Nghia Lo to Mu Cang Chai, small rooms, en suite bathroom, dining is available, rates 180.000 vnd a room with 2 single beds. Phone: 0293.897205 - 0918.177325 - 0982385440. - Pho Nui Hostel in Tu Le Tel: 029 3897 115 - 0986 308 761. - Post Office motel, phone number: 01664851820. You can make a long trip to Mu Cang Chai and Sapa. Arrange a trip for 4 to 6 days. In the north there are 4 places to see rice terraces is Mu Cang Chai, Sapa, Bac Son valley and Hoang Su Phi (Ha Giang).